I hope everyone is looking on today as practice for next Tuesday because there is a lot going on in the race today. The big news that starting coming out around 9am this morning (At least that's when a student, looking up from his laptop during the beginning moments of class told me.) was that John Edwards was going to drop out of the race for the Democratic nomination. We are taught to never say never in politics (and John McCain's wild ride on the Republican side is proof of that), but I took Edwards and his campaign at their word when they said that they were in the race for the long haul (even when that message turned to being a kingmaker at the convention). Edwards' reluctance to cede the race to John Kerry in 2004 seemed to back that up. So, color me surprised to see Edwards bow out now. There is no endorsement planned, but if you believe what some of the pundits are writing (that Edwards takes away from Obama's ability to win), then Edwards dropping out now makes a tiny bit more sense. Drop outs abound! On the GOP side, Giuliani's failed Florida strategy (skipping races rarely works) seems to have him not only on the cusp of getting out of the race but also of endorsing John McCain. Nothing is official yet, but with a debate tonight at the Ronald Reagan Library in California, Giuliani's absence would go a long way toward confirming the speculation. The two (Giuliani and McCain) have essentially switched places in this race. Giuliani has gone from national frontrunner over the summer to being out of the race before it even got to what were perceived as his strongest areas; the delegate-rich states of Super Tuesday. McCain however has gone from bottoming out over the summer to a Lazarus-style return in capturing New Hampshire, South Carolina and now Florida to become the party's frontrunner. Now the drop out and endorsement are official. Also, I caught this on NPR today. You'd expect this kind of "using his words against him" comparison on the Daily Show. Giuliani's book comes back to haunt him. "Giuliani Failed to Heed His Own Leadership Advice"
Incidentally, that debate will be on CNN and cnn.com tonight starting at 8pm (which is interesting considering that that is during rush hour for California voters). The Democrats (sans Edwards) will debate from California the following night as well. That one also starts at 8pm(ET). What does all this mean heading into next week's extravaganza? McCain looks to be in good shape, but you can't discount the impact of Romney's warchest. As we've moved to a national focus, this thing has moved on to the air war and that is where Romney could have a potential advantage. In the Democratic race, the constant flip flopping of victories between Obama and Clinton means that the race is in a basic dead heat moving into Super Tuesday. So which one has an advantage? Well, the release of the numbers from the FEC reports that are due tomorrow (Jan. 31) may give us an eye into who has more cash on hand and who has the advantage. The Drudge Report is giving McCain an ever so slight edge via the Florida exit polls. Say what you will about Drudge, but he was calling the battleground states with surprising accuracy during the 2004 election. *These are not raw numbers from the actual primary. They are exit poll numbers. Keep in mind that absentee and early voting has reached new heights in Florida during the lead up to today. The press is showing some surprising restraint (at least in my eyes) in not really saying a whole lot about the Democratic race thus far. Despite there being no delegates at stake in Florida for the Democrats, turnout has been high. Of course, as Rob rightly points out in the comments section below, there was a tax initiative on the ballot that motivated a lot people to turnout today. 7:31pm: Early results are in. Reports of a tight race between McCain and Romney were right on the mark. For the Democrats, Clinton is enjoying a margin similar to what Obama had over her in South Carolina last weekend. I should also add that exit polls are showing that the economy was viewed (see first post at botton) by over half of Democrats and by nearly half of all Republican primary voters are the biggest issue. 9:21pm: With 57% in on the GOP side, McCain has a four point lead. For the Dems, Clinton is still up by around 20 points. Is there anyway that if Obama sneaks to within 15 points or less (not really all that likely) of the lead, that he can claim some small measure of victory? I'd lean toward no, but what are other people's thoughts? CBS Evening News on their broadcast tonight had a striking figure concerning the number of ads McCain and Romney have run so far. Romney had a nearly 10-1 edge with 4000 some ads run to McCain's 470 or so. Predictably CBS replaced their pre-Florida results segment with post-Florida coverage on their online version of the news. The Fix made mention of the same statistic adding even more information (saying that that was just in Florida). See the fourth bullet point down for that. The Times also has a piece discussing McCain's spending lately. That may explain the shortness of cash in his coffers. Well, as of 9:37pm, the conservative New York Times (at least when it comes to calling winners of these things and counting delegates) has called the GOP race for McCain. That should certainly help financially heading into the smörgåsbord of primaries and caucuses next Tuesday. It is funny to think that the Florida primary is finally here after tracking the state legislature's (and the governor's) activity so intensely last summer/fall. But here it is and there is no shortage of drama. The two man race between McCain and Romney on the Republican side is equaled to some degree by the intensity with which Democratic partisans within the state are participating despite the contest being essentially non-binding. Hillary Clinton is cutting it awfully close tonight; butting up against the DNC rules. When we spoke about the the DNC's decision to strip Florida of all its delegates and the rules regarding candidates campaigning there in the live discussion group, I think the consensus was that the viable Democratic candidates would start showing up there on January 30. Well, Clinton will be there as soon as the polls close for a rally. It is never too early to start thinking about the general election, I suppose. I don't mean to give the GOP race in the Sunshine state short shrift (because the race couldn't be any tighter between Romney and McCain), but I have been and continue to be fascinated by how this Democratic race in Florida will play out (in the media and within the campaigns). Michigan was one thing: Clinton was the only "big name" on the ballot there, but the big three (or the big two and John Edwards) are all on the ballot in Florida. Clinton still maintains a comfortable lead in Florida. While I'm passing out poll links, Real Clear Politics now has poll numbers for many of the Super Tuesday states (just click on the links on the left-hand sidebar). I brought up the State of the Union in a post the other day and I tuned in last night to NBC's broadcast. Now, usually I'm a sucker for these things anyway, but last night I was intrigued by viewing the event through the lens of the current presidential race. Bush didn't mention the race but the coverage (both the shots panning the audience and the comments before and after the speech) were dripping with not so subliminal references. 1) Who made the seating chart? And do the members of Congress have any say in where they sit? Barack Obama and Ted Kennedy were side by side following Kennedy's endorsement of the South Carolina primary winner. Also, with the above two questions in mind, what are we to make of Hillary Clinton and Joe Biden sitting next to each other? I'm going to have to look into this at some point. The answer may lie in committee assignments: members of certain committees sit together. 2) Who did Mitt Romney pay to get that cushy interview spot on NBC in between the speech's conclusion and Kathleen Sebelius' Democratic response? 3) Relatedly, where was John McCain? I'm sure he too was in Florida preparing for today's last minute blitz. That and the above Romney interview were curious though. And I say this knowing full well that he may have been on one of the other networks. Being somewhat cable deprived, I didn't have access to Fox News, MSNBC or CNN, but my scan of ABC and CBS found that both had already gone to commercial while the Romney interview was taking place. 4) Speaking of Democratic Kansas governor, Sebelius, I left really impressed after she delivered the Democratic response (Good if not better than the one given by Virginia governor Tim Kaine.). I was surprised by her inclusion in some of the VP speculation lists, but that talk seems warranted after last night's effort. 5) In case you missed it in the comments section yesterday, Rich Clark had some great poll data concerning state of union viewing habits. Be sure to check it out. Now, I realize some people may be interested in the last part of the title to this post. It isn't everyday that parallels are drawn between the 40th president and the Fab Four. Hear me out though. This idea has been floating around in my head and I want to get it down on (virtual) paper. It has been argued that The Beatles affected all the popular music that came after them. Their various, eclectic phases spawned countless groups and artists who tried to emulate to some extent and expand upon any one of the musical ideas inherent in each phase. Well, how does Reagan fit into this? Is it me or is the Republican party, at least at the presidential level, not similar to this idea? Every GOP presidential candidate since Reagan left office in 1989 has tried to play up all of some of their strengths as a natural progression to the mark that Reagan left on the political world in Washington. Look at the top four candidates in the race for the Republican nomination. McCain could be viewed as the defense proponent. Romney plays the economic conservative and Huckabee the social conservative. Finally, Guiliani had ties to the Reagan administration (that he attempted to play up at last week's debate in Boca Raton). These aren't perfect matches, but it still makes for an interesting point of discussion. Is there any noticeable decay to the Reagan legacy on GOP presidential politics? Finally, thanks to Paul Gurian (via Jill Rickershauser) for reminding me of the excellent article and multimedia map on the delegates at stake in both parties on February 5. I read that too early yesterday and illness intervened to distract me from posting it. Anyway the map is below and here is a link to the article. Good stuff. How much does Bush's speech take away from coverage during the last day of campaigning before Florida? I'll be honest: it wasn't even on my radar until I saw a reminder on one of the Sunday morning talk shows. I don't recall Clinton's last SotU in 2000 but it was on a Thursday in between Iowa and New Hampshire that year (And there were just eight days between the two then.). There may be a reason I don't recall it and it may be that I was focused completely on Iowa and New Hampshire. Will that be the case with everyone else tomorrow though? I hate to jump the gun on this, but since the topic came up in the live discussion group this week and since there has been an increasing amount of chatter among the online pundits, I'll make an exception. So, who are the possible VP choices on either side? Well, being that we may be four or five months away from knowing, it is open season on guessing. The Fix over at Washington Post had a great post earlier this week naming a list of folks on both sides who may figure into the decisions of the eventual nominees. Have a look here and add any other ones not included in the comments section with reasoning behind their inclusion. Notice Georgia's own Sonny Perdue is mentioned as a possibility on the GOP end. Vice presidential choices were also on the mind of at least one South Carolina voter this week as Bill Clinton was asked in a town hall meeting there to discuss the possibilities. While refusing to do so he went through a list of models for choosing the second in command. It was an interesting approach from someone who has been there. The Caucus outlines the ones he brought up: the balancing the ticket option, choosing the person who finished second to unify the party and the pick someone similar with different strengths. Well, that didn't take long. Eleven minutes after the polls closed in South Carolina, The New York Times called Obama the winner of the state's Democratic primary. Exit polls are showing an overwhelming level of support for Obama amongst African Americans. Among whites, the three candidates were much closer when Clinton and Edwards bunch together and Obama not far behind. The question now is how well was Edwards able to do (...at Clinton's expense). The answer to that question will go a long way toward telling us whether he'll be able to survive until Super Tuesday (a week from Tuesday) and how much spin we will hear out of the Clinton camp. 7:29pm: They must round down because with 0% of precincts reporting Obama leads. Oh and don't forget to check things out over at scvotes.org. Those maps will look good once they start coloring them in. And no phone books or xeroxed copies of maps necessary. Also, The Caucus over at the New York Times has a nice live blog going concerning the primary results. So, let's do an instant analysis here. Obama has made a statement that he's going to be a factor on February 5 (that he's not just the guy who won Iowa). Clinton has has her string of victories broken and will now begin to spin the "unimportance" of South Carolina. Edwards is now left wondering whether he can keep garnering as much of the support as he has in the earlier states when it is clear he won't win the nomination. You can't be kingmaker if you can't at least pick off a decent chunk of delegates. There are now two days between now and the Florida primary on Tuesday. Do any of the Democrats venture into the state in that time? Is Edwards desperate enough even after having cast himself as the rule guy in this race (taking matching funds, staying out of Michigan and off the ballot there) to break the party rules and attempt to make some waves in Florida? And no, they aren't poll numbers or results. There are some really interesting turnout figures that are coming out of South Carolina and Florida. In South Carolina turnout for the Democratic primary today should set records as its three predecessors in Iowa, New Hampshire and Nevada did. FHQ doesn't have a much in the way of resources, but we do have a cadre of contacts scattered across the Palmetto state (in the Charleston and Greenville areas) who witnessed long lines at polling places today. The New York Times, citing South Carolina "officials," has reported that turnout will be around 350,000; up from 290,000 in 2004 (CORRECTION: It looks like the Times transposed the turnout figures in their original report. Later they estimated turnout for the SC Democratic primary at 530,000. That's a substantial increase over 2004 and more than the GOP drew in the state just a week ago.). We've played the turnout guessing game in a couple of contests thus far and we're batting .500 as far as who high turnout affects the most. In South Carolina, with nearly half of the Democratic electorate being comprised of African Americans, it is hard to say who will gain the most from high turnout. It depends on how each segment turns out. We'll have another post up for the South Carolina results shortly. But let's look at what's happening in Florida as well. Even before the contest is officially conducted on Tuesday, early voting numbers point to a high level of interest in a race that only officially involves the GOP (DNC rules have kept the major Democratic candidates out of the state.). Around 350,000 voters (the same as the number of Democrats in South Carolina today) have placed early votes either by mail or in person on the Democratic side while around 400,000 have done similarly in the Republican primary. Meaningless or not, that's a lot of votes before a contest that doesn't even count. Clinton's lead in the Florida polls has been large, but efforts are being made by Clinton and Obama supporters in the Sunshine state and that shows to some extent in the early voting numbers we see. Does that pull Obama close to even with Clinton there? And how does this affect the Republicans? Mike Huchabee has to be hoping that a lot of people cast early votes just after Iowa when he surged in Florida polls. And that is the real issue here. When were these votes cast and what political shocks were those decisions deprived of factoring in? And adding a little more to the Florida frenzy, Republican governor, Charlie Crist is backing McCain. If only the early GOP voters had known. After Monday night's brouhaha among the Democrats in South Carolina, the active candidates for the GOP nomination gathered in Florida last night to demonstrate the civility the party has to offer. With the margin between first and second in state polls tightening between McCain and Romney, you'd expect to see Giuliani come out swinging in an attempt to recapture the lead he once enjoyed in the state. At the very least you would expect to see him draw some contrasts between himself and the two candidates perceived to be ahead of him now. But that wasn't the case. If you were on stage last night you got the kid glove treatment from your opponents and an occasional one-liner from Mike Huckabee. If you weren't on the stage and your name was Hillary Clinton, you were met with some sharp criticism on everything from the war to being the epitome of the broken Washington Mitt Romney continues to talk about. So if you tuned in expecting fireworks similar to those displayed on the Democratic side earlier in the week, you left disappointed and wondering what if any effect those 90 minutes would have on Tuesday's primary. One thing that was interesting was the return to the types of attacks on Clinton that dominated these Republican debates over the summer and into the fall when she was viewed as the presumptive Democratic nominee. Just as we saw McCain's name come up in the Democrats' debate as the heir to the GOP nomination, Clinton's was the name attached to the head of November's Democratic ticket. If anything, these types of discussions force primary voters (or at least the folks actually tuning in) to at least consider general election electability to some extent. The other thing it does is drive some of the inevitability arguments that pop up in the face of any primary/caucus victory. Having said that, either a Romney or McCain victory in Florida doesn't fundamentally change the outlook of the race as February 5 approaches. If McCain wins, Romney still has his personal wealth to fall back on and Romney wins, McCain is still well-positioned in the states that are the prizes of Super Tuesday. Of course, should Romney win, McCain's poll numbers could change. But Romney's money as a factor won't change in the event that McCain pulls out another victory on Tuesday. In other news, Dennis Kucinich is set to withdraw from the race for the Democratic nomination to protect his seat in Congress. And to think, he could have been out much sooner if Ohio had been successful in moving its primaries up to January 29 last fall. The other issue that has arisen on the Democratic side is the four state pledge made by the candidates to protect the four states (IA, NH, NV and SC) which were exempted by the DNC to hold primaries ahead of February 5. DNC sanctions exist to penalize any state that jumps ahead of that point and any candidate who campaigns in such a state. Florida and Michigan both had their entire delegations stripped and because of the potential sanctions and the pledge to stay out of any violating state, the candidates have ignored Michigan and Florida. Well, until some of Obama's national cable ads were shown in Florida causing some to question whether the Clinton camp would jump into the fray and initiate some efforts in the state. Since Tuesday the Clinton folks have denied that they would break the pledge and campaign in Florida. But they did have the perfect opportunity to break that pledge in a state where Clinton has a commanding lead in the polls. There is one follow up to the blog's last post. Yesterday came and went with no endorsement from influential South Carolina representative, Jim Clyburn. With Obama looking poised for victory there, there was no need (at least strategically) to endorse someone who isn't necessarily slated for the nomination. That, and the last time Obama looked assured of victory (in relation to the polls), Clinton scored a "huge upset" in New Hampshire. Just ask Al Gore how his endorsement of Howard Dean in 2004 worked out. Polls close at 7pm tomorrow night in South Carolina and if you like to follow along with an interactive map at scvotes.org. If you missed last night's tame affair from Florida, but are nonetheless a political junkie seeking your next fix, the video is still up over at MSNBC. Thompson's out (Hunter too), the Myrtle Beach Massacre and more! I don't think it comes as much of a surprise to anyone that Fred Thompson decided to hang it up to potentially return to playing Rudy Giuliani on TV. How does his departure affect the race for the GOP nomination though. I'm sure the folks aligned with Huckabee would have liked for the former Tennessee senator to drop out before South Carolina last weekend. Here's the take on the situation from The Fix over at The Washington Post. Meanwhile they are still cleaning up the carnage from the debate hall in northeast South Carolina. If you missed the Democrats' debate from Myrtle Beach Monday night, you may want to go check it out (CNN still has the debate up and the transcript is also there.). You may also want to fire up your memory while you're at it because we'll see/hear some of this material again come general election time. The viable Republican candidates sure will once one of them emerges as the party's nominee. You can't complain when intra-party battles help your own potential opposition research for the fall campaign. What do you think? Will this debate bickering hurt both Clinton and Obama in South Carolina? And will that help Edwards? The CNN page linked above has a video with undecideds turned off by what they saw. 1) Will Jim Clyburn make an endorsement? The influential South Carolina Democrat said he wouldn't (...until after Iowa), but there is some chatter out there indicating that a well-timed Obama endorsement could happen on Thursday. Thanks to The Caucus at the New York Times for that link. Hopefully this isn't a case of a runaway blog story, but there is some other speculation to "back this up." 2) What will turnout be like for the primary this weekend? Turnout for the GOP primary was down as compared to what the state experienced for the Republican primary there in 2000, but let's remember that South Carolina has an open primary system. Independents may have stayed home last weekend so that they could participate in the Democratic contest this weekend. But it could just have been the cold, rainy weather, a crop of unsatisfying candidates or that undecideds just couldn't decide and stayed home. 3) What do Clinton's trips to California yesterday and New York today mean (track daily visits at Slate.com)? Is she ceding South Carolina to Obama or is her campaign focusing on February 5? The big win that Rob spoke about Obama needing in the comments section the other day may not mean so much if Hillary didn't give her all in the state. If you haven't already, head over to politickerNV and check out David Damore's wrap up of the unprecedented week that was in Nevada last week. CQ has a great article up about efforts on the part of the RNC to reform the presidential nominating process (eg: to keep frontloading in check). Here's the thing: The Democrats were the party of change on this front starting with the radical changes to the system for the 1972 cycle and tweaking those changes into the mid-1980s. After Bill Clinton took office though, and on through the present, it has been the Republicans who have been the most active in trying to reform the frontloaded system. * Starting in the lead up to the 1996 convention there was talk of a delegate bonus incentive system to motivate states to position their delegate selection events later on the calendar (see Busch 2000). When that plan didn't pass muster, the GOP again tried to cure what was perceived to ail the nominating system during the 2000 Republican convention. The Delaware plan, as it was/is called, would allow the small states to go first, nurturing the retail brand of politics that has been the hallmark of the Iowa caucuses and New Hampshire primary for decades and then let progressively larger states fall in behind them sequentially. Of course this rehashes the same sorts of issues that plagued the Founders when they were trying to conceive of an appropriate legislature for a nation in its infancy. The divisiveness of big states vs. little states plus the reality of getting the state legislatures and states parties to fall in line behind the plan gave pause to an image conscious party attempting to show unity behind its nominee. "• Modified Delaware Plan: The latest version of the proposal initially approved but then rejected by Republican officials in 2000, the Modified Delaware Plan is being spearheaded by Republican National Committeeman John Matlusky of Delaware. This plan would divide the nation into four “pods” that are organized by population. 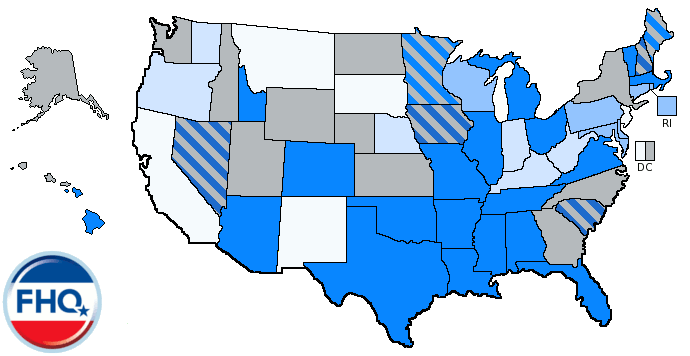 The least-populous states would be placed in one pod and vote first, followed in series by the next more-populous states. Under this plan, voting events would begin later than they have in 2008 and other recent election cycles and would be spread out over a four-month period. The Modified Delaware Plan would preserve the early-voting traditions of Iowa, which could hold its precinct caucuses as early as the last Tuesday in January (Jan. 31 in 2012), and New Hampshire, which could hold its kickoff primary as early as the first Tuesday in February (Feb. 7 in 2012). The states in the first pod would then begin voting on the second Tuesday in February (Feb. 14 in 2012) and would consist of Wyoming, Vermont, North Dakota, Alaska, South Dakota, Delaware, Montana, Rhode Island, Hawaii, Maine and Idaho. Six other jurisdictions that are not states but elect convention delegates — the District of Columbia and the territories of American Samoa, Virgin Islands, Guam, Puerto Rico and the Northern Marianas Islands — also would be included in this earliest grouping. • Ohio Plan: Promoted by Ohio Republican leader Bennett, who made a presentation Thursday, the Ohio Plan would create a pod of small-population states that would be permitted to vote first in every presidential election year. It differs from the Delaware Plan in that the Ohio Plan’s three other pods would be based on region and not scaled according to state size. 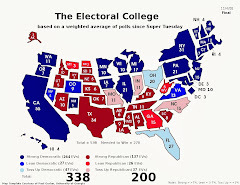 These groupings — one of states in the Eastern and Midwestern United States, one encompassing the South and other covering the West — would have roughly similar allocations of electoral votes, and would rotate their order in the nominating process every four years. The Ohio Plan would allow Iowa and New Hampshire to go before other states — and it also would extend that special exemption to Nevada and South Carolina, which the DNC included as early-voting states for the current 2008 campaign to lend greater geographic and racial diversity to the early-voting period. Those four states only would be allowed to hold a primary, caucus or convention before Feb. 1 in the presidential election year. • Dingell-Anuzis Modified Plan: For those who follow politics in Michigan, the state that generated this plan, that name is not a misprint. It is a bipartisan effort promoted by Debbie Dingell, a prominent Michigan Democratic activist whose husband is veteran Democratic Rep. John D. Dingell , and Saul Anuzis, chairman of the Michigan Republican Party. Debbie Dingell is a high-profile opponent of Iowa and New Hampshire’s primacy in the presidential selection process. The longstanding opposition among Michigan politicians to the overwhelming influence that Iowa and New Hampshire have long held over the presidential nominating process spurred a bipartisan agreement to hold the state’s 2008 primary on Jan. 15 — even though the move violated each major party’s scheduling rules setting Feb. 5 as the first date for most states’ contests, spurring the DNC to strip its Michigan affiliate of all its convention delegates and the RNC to penalize the Michigan GOP of half its delegates. The Dingell-Anuzis plan is patterned after legislation sponsored in the U.S. House (HR 1523) by Michigan Democratic Rep. Sander F. Levin and in the U.S. Senate (S 2024) by Florida Democrat Bill Nelson . Democrats in Florida, who have gone along with a new state law setting its primary for Jan. 29 in violation of national party rules, also has been denied all of their national convention delegates by the DNC (while Florida Republicans similarly have lost half their delegates). The Michigan-based plan would divide the nation into six regions, from which six “interregions” — made up of one or two states from each region — would be shaped. Each interregion would vote two or three weeks before the next interregion. The Dingell-Anuzis plan would create a lottery 14 months before the presidential election to determine the voting order of the interregions. The same interregion could not go first in consecutive presidential elections. Their plan also places Iowa and New Hampshire in their respective interregions and would not automatically permit them to vote early. • Modified NASS Plan: Sponsored by Republican National Committeeman Ron Schmidt of South Dakota, this is essentially the plan long promoted by the National Association of Secretaries of State (NASS), the organization of state election officials. 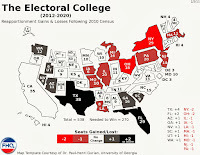 It divides the nation into four regions — the East, South, Midwest and West — and each region would be given an election date before which it could not vote (early in March, April, May or June). The region that votes first, in early March, would vote last in the next presidential election year, and the region that voted second, in early April, would then move up to first. The major difference between Schmidt’s version and the NASS plan is that Schmidt’s does not allow Iowa and New Hampshire to vote first. The NASS version allows exemptions for Iowa and New Hampshire to keep voting earlier than the rest of the nation. • Texas Plan: This proposal, sponsored by Republican National Committeeman Bill Crocker of Texas, would divide the nation into four groups, with each drawing in a few contiguous states from one particular area of the nation and a few contiguous states from another area of the nation. One of Crocker’s groups, for example, would take in the Midwestern states of Wisconsin, Michigan, Illinois, Indiana and Ohio, and also the Southern states of Texas, Oklahoma, Arkansas and Louisiana. The states in the first group could hold binding nomination contests as early as Feb. 1, with the three subsequent groups to follow in early March, April and May. Like the NASS plan, Crocker’s proposal includes a provision that the group voting first in one presidential election year would vote last in the next election. This plan also would end the special privilege to go first that has long been accorded to Iowa and New Hampshire." One plan not mentioned as being considered is Thomas Gangale's American plan (in PS, Jan. 2004). In that plan, the randomness of what's called the Dingell-Anuzis modified plan by the RNC plays some role, but the largest states have the possibility of being positioned as early as the fourth week of the process. So while the plan protects the smaller states from being completely ignored in the process, it doesn't automatically shunt the larger states to the back of the line. I've liked this plan since I first read it, but understand all the same that the American public may not go for what is essentially a lottery to determine which states go when. Simplicity seems to be what people want as there has been some support for the idea of a national primary through polls taken during this current cycle. *This isn't to say that the Democrats have done nothing of late to reform the system. Some of the problems associated with frontloading find their root in the notion that Iowa and New Hampshire have too large a voice in the process. In answer to that the DNC included Nevada and South Carolina among the states exempt from sanctions attendant to positioning a delegate selection event ahead of the party's designated window (Feb. 5 is the earliest all non-exempt states were allowed to go during this cycle.). The reason they were included was to diversify the voices of the early states. That goal was accomplished but it also exacerbated the frontloading problem by bumping two states (and a group of states campaigned for two those spots given to South Carolina and Nevada in the summer of 2006) up in the process. Florida and Michigan were the two most notable states which took exception to this. So why is it that South Carolina and Nevada get a seat at the table occupied by just Iowa and New Hampshire previously and other states, which have their own issues to bring into the process get sanctioned for moving. That is the issue at stake for both parties as they eye 2012. 7:41pm: Very early but with one percent of precincts in, McCain has a 38-23 lead over Huckabee (Look, I said it was early.). 8:05pm: Just to show you that 1% isn't representative of the entire state of South Carolina on the GOP side: McCain 34, Huckabee 30 with 12% in. This one could be fun. Third place seems like a real battle between Thompson and Romney with hovering around 14%. 9:29pm: The New York Times is calling the race for McCain. When you look at that 15% that Thompson got you can't help but wonder how much that hurt Huckabee's chances at a win in SC. He (Huckabee) has a tough row to hoe now. Meanwhile the Democrats had a caucus in Nevada as well, where Hillary Clinton continued a streak of her own. She has now run her streak of victories to two (three if you want to count Michigan and the DNC isn't) after an initial setback in Iowa's caucuses. And boy were the polls from earlier in the week wrong. What looked like a tight three-way race for the Silver state turned into a tight two-way race as former North Carolina senator, John Edwards managed a meager four percent of the vote. Clinton and Obama split the remaining 96%, 51-45. Obama didn't seem to get the support he was hoping for from the endorsement of the Culinary Workers union. While the union's endorsement was seen as a big deal, it didn't prove influential among the rank and file members as some strayed into the Clinton camp. While the GOP is off until Florida on January 29, the Democrats have their own primary in South Carolina next Saturday where the support of African Americans will be key to which ever candidate claims victory there. With 2008 marking the first time that Nevada has been in the presidential nomination limelight, there are a lot questions about the caucus process there and about how the state has dealt with the hurdles involved in getting a high-profile race up and running. To the aid of those of us here and Georgia and other parts outside the Silver state comes politickernv.com for all your Nevada political needs. A big thanks to Dr. David Damore at UNLV for the link. And be sure to check out his most recent post in the middle column under Opinion (here's the link). It's a great summary of what's happening and what may happen in the lead to Saturday's caucuses. Someone has to win this thing, right? First Huckabee. Then McCain. Now Romney (Sorry Wyoming. If the GOP race continues like this, those eight delegates may eventually prove consequential despite the lack of coverage ten days ago.). The AP is projecting that Romney has won the Michigan primary by a similar margin to what McCain won New Hampshire by last week. Honestly, don't be surprised if Fred Thompson wins in South Carolina over the weekend. So once Giuliani wins in Florida the Republicans can start over again on Super Tuesday. --with 11% of precincts in. Meanwhile Clinton has a commanding 2-1 lead over "uncommitted" on the Democratic side. Oh and the Democrats are debating (sans Kucinich). I'm on the outside looking in since MSNBC and laptop aren't on speaking terms tonight. If you are in the same boat I'm in, The Caucus blog over at The New York Times is live blogging the debate. Wave good bye again to the novelty of retail politics for another four years as the campaign shifts from the up close and personal politics of Iowa and New Hampshire to practicing new techniques in the lead up to the twenty-two state blitz on February 5. Today that blitz begins with the voters in Michigan. Well, half of the partisans in the Great Lakes State will be participating in the state's 2008 presidential primary as the GOP candidates battle for another pre-Super Tuesday prize. On the Democratic side, national party sanctions have done well at keeping the candidates away. Most don't even appear on the ballot. During the period that the constitutionality of the distribution of primary voter rolls was being questioned, thus threatening the state's primary, efforts were made to change ballot access rules to prevent candidates from keeping their names off the ballot (Does this sound like democracy?). Stalling Democrats in the Michigan legislature prevented this measure from taking immediate effect meaning that only Hillary Clinton, Chris Dodd, Mike Gravel and Dennis Kucinich appeared on the ballot. This fight and the broader one between the state and the national party set the groundwork for today's non-contest for no Democratic delegates in Michigan. The major candidates on the Democratic side (and Dennis Kucinich who by court order won the right to appear, though MSNBC is appealing) are in Nevada gearing up for tonight's debate (live on MSNBC @ 9pm--I'll have a link for the online version when it is made available.) ahead of Saturday's caucus in the state. Some Nevadans are irritated with the timing and others with location. Who doesn't want to caucus on Saturday morning in a casino? The GOP seems content to fight it out in Michigan today and skip Nevada on Saturday in favor of the South Carolina caucus on the same day. Those who win South Carolina (since 1980 when the primary system hit the state) win the Republican nomination. Nevada's loss is South Carolina's gain. First thing's first though: Michigan. Real Clear Politics' average of the six most recent Michigan polls has Romney with a slight edge over McCain (who won in there in 2000) with Huckabee running third about ten points back. So we may be witnessing something of a replay in New Hampshire at least as far as the major players are concerned. Should the results play out similarly, Romney will be on the ropes. However, should he win today's primary that jumbles this race even further making Giuliani's "wait until Florida and Super Tuesday" strategy look like pure genius. You can't discount luck in politics. You may have heard that Obama and Clinton have been sparring over racial issues. I'm still trying to figure out if not having an event this week gives that story more steam. Neither side has appeared too positive which Edwards must be loving. He got a boost in Nevada early this week with some poll numbers that have him (27%), Obama (32) and Clinton (30) within five points of each other. This is the only poll from the state since December (see RCP). Interesting news heading toward the weekend contest there. Tonight's debate will certainly have some say in how things play out. Finally, it looks like the presidential race has been fairly newsworthy so far. Last week during the New Hampshire primary, the race accounted for 49% of the news according to the Project of Excellence in Journalism. Sadly this blog wasn't a major part of that (Thank you very much SPSA conference.). As always I'll be online tonight tracking the results and the debate if anyone is interested in discussing matters ahead of tomorrow's live discussion group meeting. Well, that didn't take long. Less than two hours after the polls closed the race has already been called for McCain on the GOP side (8:30pm). The real surprise is that with 15% of the precincts reporting Clinton leads Obama 40-36 with Edwards a distant third. Early numbers indicate that New Hampshire women are going with Clinton in a reverse from what happened in Iowa last Thursday (see 8:32pm post in above link). UPDATE: The numbers on the Democratic side largely held up as the precincts continued to come in. So Clinton won a "shocking" comeback victory and the polls fooled us all. New Hampshire Turnout. Who has the Advantage? Much like I did last Thursday for the Iowa caucuses, I would like to think out loud about the effect turnout might play in today's New Hampshire primaries. There aren't any specific numbers being floated around today by either the candidates or the pundits like there were in the lead up to the caucuses in Iowa last week. However, on a general level, higher turnout is going to help the candidate with the most momentum, more often than not. This is clearer on the Democratic side than it is on the Republican side. There Huckabee is the momentum candidate, but the polls have shown what many thought coming out of Iowa: that Huckabee wouldn't necessarily play well in New Hampshire. It is less clear how this affects the race between McCain and Romney. For Democrats, Obama qualifies as the candidate with momentum. This has been reflected in his rising poll numbers both in New Hampshire and nationally since Iowa. But today there have been reports already about long lines waiting to vote and requests to the Secretary of State for more Democratic ballots. This is a pretty clear indication that Obama could be in for a big night tonight when the results begin coming in. Polls close at 7 pm. Early New Hampshire polls indicate that Obama has moved up 5-10% in New Hampshire while Clinton has slipped a bit. Clinton’s perception as “inevitable” and “unbeatable” has been shaken. However, Clinton still has a substantial following and a strong organization. Frontrunners often lose Iowa but go on to win New Hampshire and the nomination. Obama got a boost in Iowa. He showed that he’s truly competitive with Clinton and that he can win among white voters. By defeating Edwards, he took a big step toward becoming the alternative to Clinton. Democrats who don’t like Clinton have been divided among several candidates; they may now rally around Obama. Edwards survived but did not improve his position. He needs to either win or come in a close second in New Hampshire to remain viable. Romney lost ground in Iowa. If he loses New Hampshire, he’s in serious trouble. Huckabee got a big boost from the Iowa results. He needs to follow up this victory with a strong showing in New Hampshire or Michigan and a win in South Carolina. New Hampshire is not friendly territory. Huckabee may get a boost from his victory in Iowa but probably not enough to defeat either Romney or McCain there. McCain benefitted from the Iowa results. McCain needs to win New Hampshire and his main opponent there, Mitt Romney, did poorly in Iowa. That will likely help McCain in New Hampshire. Early New Hampshire polls show McCain with a slight lead over Romney in New Hampshire, with Huckabee a distant third. Giuliani’s hope is that no one candidate will emerge from the early contests with momentum. Giuliani is pinning his hopes on Florida and Super Tuesday. So he was probably pleased to see Romney fail to win Iowa. However, that increases the likelihood of McCain winning New Hampshire and gaining momentum. Fred Thompson survived Iowa, but he’s running last in New Hampshire and is not especially strong anywhere else. New Hampshire has an “open” primary. Since there are a lot of independents in New Hampshire, those voters can make a difference. This year, New Hampshire independents seem to like Obama and McCain. An average of New Hampshire polls taken January 4-5 show McCain with 33%, Romney with 28%, Huckabee with 11%, and Giuliani with 10%. Among Democrats, Obama has 35%, Clinton 30%, and Edwards 20%. If the results match the polls, Edwards, Romney and Thompson could be on their way out. South Carolina looms large for both parties. Stuck on a first Tuesday in May date again for the 2008 cycle, Indiana is among the first to begin thinking about moving its presidential primary for 2012 (Granted, many of the states that moved for the 2008 cycle moved permanently as opposed to the temporary move the NY legislature used in the 1990s.). State Rep. Suzanne Crouch (R-Evansville) has said recently that she plans on introducing a bill during the general assembly's 2009 session to move the state's primaries (all of them) to an earlier date. I found it odd that Rep. Crouch would wait until next year when momentum may no longer be behind moving the primary. The assembly does meet every year unlike some states out west (eg: Oregon), which meet only every other year. So that wasn't the issue. As the above article indicates several measures moving the primary have been proposed in the past only to fail. The difference this time seems to be that Rep. Crouch is advocating moving not only the presidential primary but the state and local primaries as well. Not to toot my own horn, but my own research has found that this is a major obstacle to a state frontloading its presidential primary. States that hold those two sets of primaries together are confronted with either moving everything or with creating an entirely new election for the presidential primary. Both cost money and states in this position are often hesitant or unwilling to make the jump. So when we talk about frontloading, we are often talking about a state's ability to actually make the move. Those states with separate presidential and state/local primaries have a much easier job than those states where laws exist wedding the two primary types together. Indiana falls into this category. Once a state shows the willingness to move though, subsequent moves are all the easier to push through later (if need be). Maryland is a good example here. The state requires their primaries during a presidential election year to all be held at the same time. The state had already made the move to hold its presidential (and all others) on the traditional Super Tuesday (the first Tuesday in March) and when Super Tuesday moved up a month to the first Tuesday in February, the Maryland legislature had little trouble in inching its primaries up to maintain its position. Though, I should note that the legislature opted to move the primaries to the week after Super Tuesday (the second Tuesday in February). The nomination fight left Iowa Thursday and headed, for the most part, to New Hampshire in anticipation of Tuesday's primary there. However, the GOP took a small detour to Wyoming today, for a caucus there. Mind you, this detour did not include any immediate attention from any of the Republican candidates, but it did include a caucus that distributed twelve delegates to this summer's GOP convention in Minneapolis. Small peanuts, sure. But a win's a win and Mitt Romney can now lay claim to a win in Wyoming's county conventions; wrapping up eight of the twelve delegates at stake. What impact does that have on New Hampshire for Tuesday? Given that you really have to dig to find any news of this and the fact that visits from the candidates were limited at best, I doubt much affect will be felt. The New Yorks Times blog The Caucus is reporting that Romney has conceded and that's with just fifteen percent of the precincts reporting as of 8:05pm (IA time). On to South Carolina for Huckabee and Romney heads to New Hampshire to try and hold off McCain for the next few days. For the Dems, it is a tight race. Obama tops the list and Edwards is literally a handful of votes ahead of Clinton with 50% of the precincts in. UPDATE: Things are still tight on the Democratic side. Obama seems to be pulling away but as of 8:30pm Edwards led Clinton by just three votes. Obama is doing better than expected in conservative area; areas considered to be Edwards' strongholds. UPDATE: The New York Times is calling the Democratic race for Obama. With 84% of precincts reporting (8:41pm), Obama led with 37% of the vote. Edwards still holds an extremely slim edge over Clinton (just four votes). Let the spin begin from those two camps. The way I read it, a third place finish is a third place finish for Clinton. It will be interesting to see how they play that as the race shifts to New Hampshire. UPDATE: At 9pm with 92% of the precincts in, Obama-37, Edwards-30 and Clinton-30. Edwards holds a nine vote lead over Clinton. Iowa Turnout. Who has the advantage? There are a couple of numbers floating around today concerning turnout in tonight's Iowa caucuses and the expectations for who will come out victorious there. The thinking from within the campaigns and among outside observers is that high turnout is good for Obama and Huckabee. The Fix over at The Washington Post has cited the 200,000 caucus-goers as the line of demarcation for Obama. If the number tops that figure the advantage goes to the senator from Illinois according to his campaign (see here and here for more). As The Fix points out though, that is based on the idea that the growth in caucus participation is weighted toward Obama when in fact the distribution between the top three Democrats could be more even. The second choice voters are still important in Iowa as well. If their candidates don't reach fifteen percent, who do they back? Some polls seem to indicate Edwards and others Obama (The Edwards link is a little dated, but NBC reported as recently as Sunday night (Dec. 30) that Edwards led for the second choice folks.). 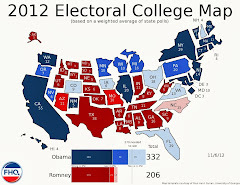 Now, if the new caucus participants go for Obama and the supporters of the "non-viable" candidates align behind Edwards, will Hillary sink to third? On the Republican side, 80,000 is the mark for Romney and Huckabee. The Romney camp has stated that anything over that number of caucus-goers could spell trouble for the former Massachusetts governor. Under that scenario, Huckabee's grassroots rise would likely bring enough new voters to the caucus to provide him with a victory. Let's get the 2008 primary season underway with complete access: You can watch C-SPAN's coverage of the Iowa caucuses online tonight here. As of 10:15am (Jan. 3) both links (C-SPAN for the Dems and C-SPAN2 for the GOP) were working. Happy New Year! It's a Presidential Election Year! Here we are a day away from the official kickoff of the presidential primary season (Sorry caucuses, but research shows that you take a backseat to primaries--see Gurian. Ah, shameful namedropping.) and things are still up in the air in both parties. It's the beginning for the American electorate (or at least for those that care to show up for the primaries) and the beginning of the end for all but the most viable candidates with the exception of perhaps Dennis Kucinich and Alan Keyes. So what's been happening on the trail since the last update? percent. Mitt Romney follows at 12 percent with Fred Thompson at 9 percent. The survey was conducted Dec. 19-30 and has a 5 percent margin of error. is in a virtual tie with McCain in those states. Barack Obama, 46 percent to 26 percent, with John Edwards at 14 percent. So the national polls indicate McCain is a factor again in the race for the GOP nomination and Hillary is running away with things on the Democratic side. And while the US has the closest thing it has ever had to a national primary day with this year's February 5 Super Tuesday, these nominations still play out on the state level with Iowa and New Hampshire still going first. Mitt Romney at one time or another had fairly comfortable leads in both Iowa and New Hampshire. But Mike Huckabee and John McCain have challenged those leads in Iowa and New Hampshire respectively. With McCain basically writing Iowa off to focus on New Hampshire, the two-pronged attack on Romney in both early states is causing the former Massachusetts governor to split time between both states instead of going it one at a time. Here's the deal though. Romney and Huckabee are in essentially the same position as the top three Democrats in Iowa: neck and neck. That one could go either way. In New Hampshire though, McCain is going to rely on independents to once again deliver a victory in the Granite state. However, the LA Times is reporting that Obama could be siphoning off some of that independent support from McCain in the state (I apologize for the link to an Obama supporter blog, but the LA Times has already password protected that article For those that want to read the article from the source, a link is included and registration for the paper's site is just a click away.). Still locked in a three-way tie in Iowa, Clinton, Obama and Edwards continue to make last minute pitches to potential caucus goers. The thing that is going unnoticed again (as it did in the 2004 Iowa Democratic caucus) is the second choice voters. Now, the rules of the caucuses stipulate that supporters of candidates receiving less than fifteen percent can move to those other candidates in the upper tier. NBC Nightly News on Sunday (December 31) reported that Edwards was becoming the favorite second choice of those not already aligned with any of the top three candidates. The Edwards camp is also playing up the results of a poll that reallocates based on second choice votes (Edwards enjoys a 41-34-25 edge over Clinton and Obama respectively.). These second choice folks were the same ones that catapulted Edwards to his surprising second place finish in the state in 2004 and that bloc is still one to keep our eyes on tomorrow night. UPDATE: Kucinich has urged his Iowa supporters to back Obama in the event that he does not reach the necessary fifteen percent. 4) If you haven't already and like to reminisce about campaigns past, be sure to check out CQ's review of presidential nomination campaigns since 1912. It's a nice eight part read. 5) Paul mentioned it before in an earlier email, but let me mention it also: C-SPAN is offering live coverage of the Iowa caucuses again this year. Here's the link. If I find that it will be simulcast online I'll send around that link as well. If they aren't covering it online (and I'm sure Paul will tape it), I'm going to try and DVR it through my media player and briefly post a "pirated" version on either this blog or my website tomorrow night at the conclusion of the coverage. I'll need to check on the space capacity of both first. But I'll find a way to get it up there for the group. Also, I'll be online tomorrow night to post and discuss the results, so come on by at your leisure to talk about all things Campaign '08.